Wolves are the ancestors of domestic dogs and are the largest of the canine family. Despite their name, these wolves can be gray in color, black or all white and look a lot like a German Shepherd or malamute. Once on the endangered species list, wolves are gaining in number in the Rockies, Great Lakes and the Southwestern United states. Their survival at any cost mentality is keenly seen in the diet of this canine. Although preferring fresh large game such as elk, deer, caribou and moose, the wolf will also consume an animal that has died due to disease or untimely death. When fresh hoofed animal meat is scarce wolves are known to feed on squirrels or other small prey; whatever is necessary to their survival. Alaska is home to just over 11,000 gray wolves, whereas the lower 48 states plays home to more than 5,000 of these beautiful animals. Worldwide there is an approximate number of 200,000 wolves; a far cry from the two million from years gone by. Once common throughout all of North America, wolves had been killed off in many areas by the mid 1930’s. Today, their living space has been greatly diminished in size and consists of Canada, Alaska, Michigan, Montana, Minnesota, Idaho, Wisconsin and Wyoming. Wolves are social creatures and always travel and hunt in packs of around 4 to 7. The alpha male and female in the pack are the leaders and decide where to rest, hunt prey and institute the packs' geographic territory. The wolf pack usually consists of the parents, their cubs and possibly one or more subordinate wolves. Much like human families, the wolf pack is loyal to the pack, defending it to the point of sacrificing their own life for the packs' protection if necessary. The communication system of wolves consists of barks, yips, whines, howls and growls. Contrary to popular belief, wolves do not howl at the moon. Instead, they howl in order to locate one another, sound an alarm or regroup. 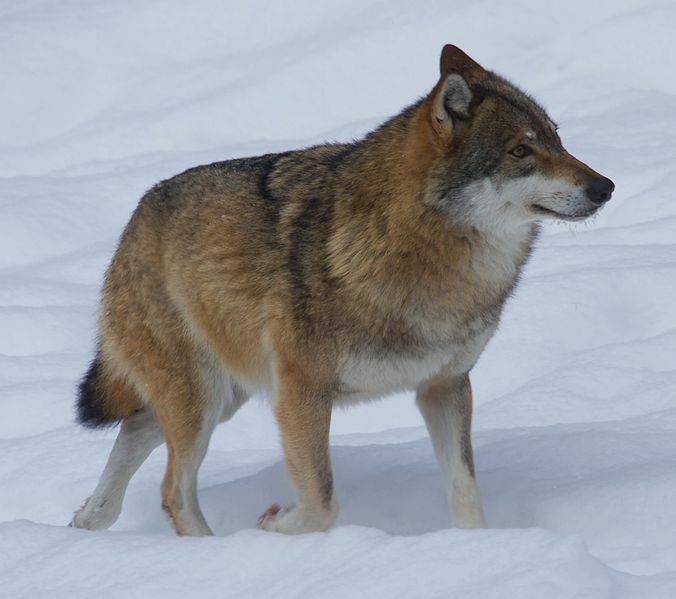 The wolf's mating season occurs during the months of January and February. The mother wolf delivers around four to seven pups. Wolf pups are born blind and completely helpless. The entire pack has the responsibility of caring for the pups until maturity which is usually when they reach ten months of age. The wolves face threats every day from other wildlife but the most lethal threat to these animals is man. Although it is extremely rare for a wolf to attack a domesticated farm animal, it does happen on occasion. When this occurs the wolf will most likely be shot to protect other farm animals. Yet another threat to the wolf population is human encroachment into the wolf’s area. This overtaking of land leads to loss of prey for the wolves to eat as well as the senseless slaughter of the wolves. More than any other threat to this species is the fear and misconception of people regarding the wolf. On the other hand, a wolf may attack if they feel that they or their pack is threatened.